My taste in pizza runs strongly to the Neapolitan, and the pizza I make most often at home has a very thin, crisp crust. But I am by no means some kind of Neapolitan absolutist: I keep an open mind about the many styles of pizza in the world. Sometimes I even make a different style at home — like last night, when I got a craving for doughy, pillowy-crusted pizza. Without any dough prepped, I needed a crust that could be assembled and baked within a couple of hours. Focaccia is perfect for this — its flavor might be a little better with an overnight fermentation, but in a pinch it is a great bread to throw together. 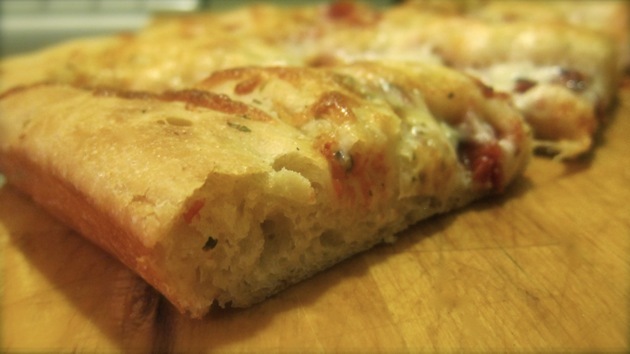 As a baker, I happen to think pizza is always mostly about the crust, but with an assertive bread like focaccia as its base this pizza called for the simplest of toppings: some tomatoes, dried oregano, and a sprinkling of mozzarella cheese. The first thing to notice about this dough is that its hydration level is 80%: that’s way to wet to knead by hand. You could use the stretch and fold method, but it will greatly increase mixing time and should really involve an overnight rest. If you have a machine at your disposal, this is the time to use it: I combined all the ingredients in the bowl of my stand mixer and mixed — with the paddle to combine then with the dough hook — for about 9 minutes. But this batch was too small for my mixer to handle: the hook was missing a lot of the dough. The next time I make focaccia, I’ll use the food processor. Combine all ingredients in the food processor’s bowl using the steel blade and process until the dough comes together and is smooth, about two minutes. 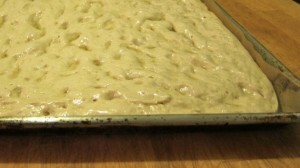 Allow the dough to rest in an oiled medium mixing bowl for an hour until approximately doubled. Preheat oven to 425ºF. Line a half-sheet pan with parchment and spread two or three tablespoons of olive oil evenly over the parchment. Pour out dough onto lined pan, top with another couple tablespoons of olive oil, then use your fingertips to spread the dough to fit the pan. It probably won’t fully cover the corners, but get as close as you can. Cover the dough with plastic wrap and allow to rest another hour, until the dough looks bubbly and full. After dough has risen the second time (in the pan), spread the tomatoes evenly over it and sprinkle with oregano. Distribute the cheese evenly over top. Bake 18-20 minutes, until crust is golden and cheese has started to brown in spots. This entry was posted by Tom on Friday, November 12th, 2010 at 8:19 am and is filed under Pizza, Recipes. You can subscribe to responses to this entry via RSS. I’ve never had luck with using the dough hook. The dough just sticks to the hook and spins around in a circle or it just moves it around without doing much kneading. For most doughs, do you prefer hand kneading, dough hook, or food processor? For doughs using more than 20 oz of flour, the dough hook usually works for me, pushing the dough around as I would with my palm when hand-kneading. Between the methods you mention, I can’t say I have a preference: it really depends on the bread I’m making. That said, I have a relatively small food processor (7 cup?) so it can only take smaller batches, and I’ve only had a mixer for two months, so I’ve yet to understand the full range of possibilities. But I don’t see any reason we can’t live in a world with multiple kneading possibilities!